The devil seemed to be in the details for Ricardo Tisci’s Womenswear show at Menswear. 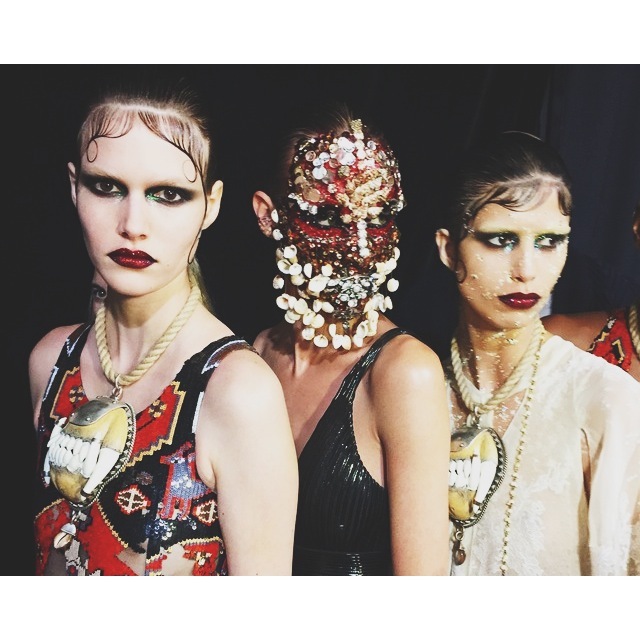 With show notes referring to Ricardo Tisci’s “darkest obsessions,” Givenchy’s Autumn Winter 2015 presentation featured a wicked undertone – more beautiful then frightening – with the scene boasting a catwalk of red glitter and models wearing Pat McGrath-created gothic makeup looks (based on African masks). Tisci who is known to be a collector of mystical items and religious artifacts, splashed diluted skull decorations and a bold magnified Moroccan carpet motif across a myriad of items, including jackets for men and dresses for women. Other standout ensembles on the runway included leathers that rounded up the strong outerwear looks with dangling raccoon tails, denim jackets with brown suede collars and Tisci’s trademark of men wearing skirts over their tapered trousers – giving us a sinfully sweet set of Givenchy looks. This entry was posted in Trend Reports and tagged edit, fashion, Givenchy, paris fashion week, pat mcgrath, Ricardo Tisci, runway, style, womenswear. Bookmark the permalink.